Sukhothai (in Thai: สุโขทัย) was the capital of an empire of the same name founded in 1238 A.D. Before the rise to power of King Re Pho Khun Sri Indraditya, the Thai region that also included Sukhothai was dominated by the Cambodian Khmer Empire, which in turn was formed by fiefdoms spread out across the territories that today are part of Thailand and Cambodia. The fall of the Khmer kingdom took place thanks to two Thai generals (one of which was called Indraditya, who became the first king of Sukhothai) who managed to chase out the Cambodians from Thai soil. From 1238 onward, the Kingdom of Sukhothai conquered and dominated all of Thailand, the northern part of Laos, and even vast areas of Malaysia, and the city of Sukhothai was the capital for a good two centuries. 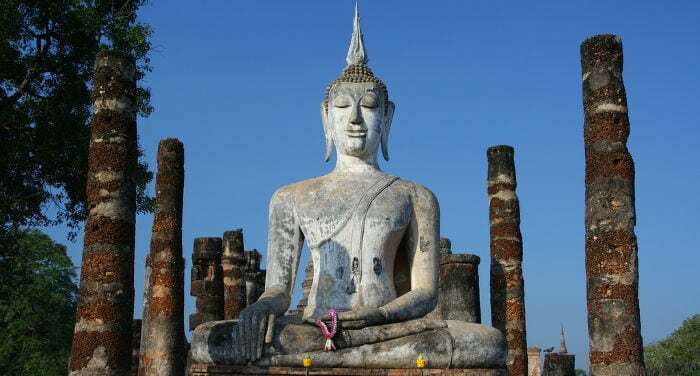 With the death of the last king (Ramkhamhaeng), Sukhothai began to lose its political and religious influence, and in 1376 it became a vassal state of the new Kingdom of Ayutthaya. When however in 1767 Burmese troops invaded Ayutthaya, it collapsed and the entire region of Sukhothai remained deserted and abandoned to itself.